In addition to the written evidence concerning sanitation in Jamaica, there is the testimony of archaeology. Besides the ceramic artifacts discussed elsewhere, the most important of these finds was the wreckage of an actual "house of office" found in Yard 5 of Building 4/5. 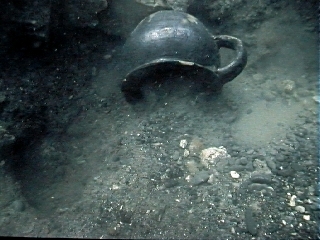 This was excavated by Texas A&M University and the Institute of Nautical Archaeology in 1990. 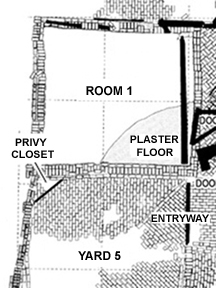 Comparable privies had also been excavated during the course of the New Street excavations of the 1970s. The remains consisted of one brick wide foundations measuring about 2 by 3 feet over the brick paving of the yards of several buildings. No wooden parts of the outhouses themselves survived on this terrestrial site. There was one privy associated with each building, except for a tavern that had two privies to accomodate its patrons (Brown, 155-56). Since there were no pits, and since there were associated chamberpot fragments, these appear to have been bucket privies, rather than pit privies, for the reasons discussed above. The structure near Building 5 was set at an angle against the Northwest corner of the junction of the south outside wall of Room 1 of Building 5 and the yard wall [see Plan]. 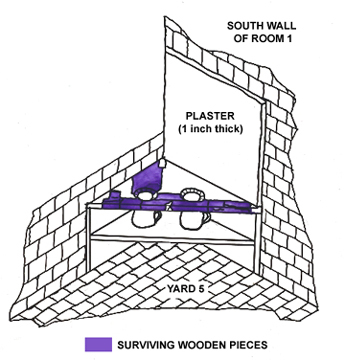 A one-inch thick covering of plaster was found on the outside of the south wall of Room 1 [seen at left]. The bottom edge of this plaster extended from the midway Course 4 (header course) of the bricks; it then continued up for approximately 3 feet. The exterior edge of the plaster reached just past stretcher #6 (out from the exterior corner of the south wall). The plaster had a rounded corner in the lower right area, and an inscribed one-half to three-quarter inch line around the plaster edge. This inscribed edge appears to have been where the wood for the seat platform had been located. A cut out area can be found about 2 stretchers back from the right edge of the plaster; this seems to be a space for some sort of insert into the plaster, possibly the seat. There was no break in the brick paving of the yard to allow for a privy pit or cesspool. A number of items were found that identify this area as a privy. Short wooden planks were discovered in the area of the "house of office." There was a complete chamberpot and a number of chamberpot sherds in this excavation square, several pieces of wood that fitted together to form a platform with two circular openings, and what appeared to be a 30 cm diameter wooden lid with a central knob. The wooden items were swept to the east along the south wall away from the corner when the yard wall collapsed at the time of the earthquake or later. This can be seen in the site plan. Since the diameter of the openings is only slightly less than that of the lid, it seems likely that this was a toilet lid to fit one of the privy seats (below). This would have been helpful to reduce flies and odor. Since there is no provision for a cesspool, and there is so much evidence of chamberpots, it would appear that this was a "bucket privy." Waste was deposited in containers that were later taken away to be dumped in a midden, as described by Edward Ward in 1698. The average house of office found in the New Street excavation was only large enough to accomodate a single user, while the Building 5 privy is a "two holer." It is thus resembles the New Street tavern, which had 2 privies in its yard. Is it possible that Building 5 was also a commercial establishment that needed to accomodate customers? The layout of the building, with two doors to the street -- one leading to a large room with windows and the other to a windowless room, supports this possibility. The large oven in back was surrounded with artifacts associated with baking. If the building was a bakery, cakeshop, or tearoom, it might have had many female customers. Historically, two-seat privies have often been used by mothers and children. Many examples from England even have the second seat at a lower height. This might explain why Building 5 has a single two-holer, rather than two separate privies as at the tavern. At this point, any conclusion would be speculative, as it is still possible that this was merely a very large household that needed extra toilet and baking facilities.